The vision of the project is to create a tool to transparently manage all the complex parts of modern development within a virtual environment without affecting the everyday workflow of the developer too much. 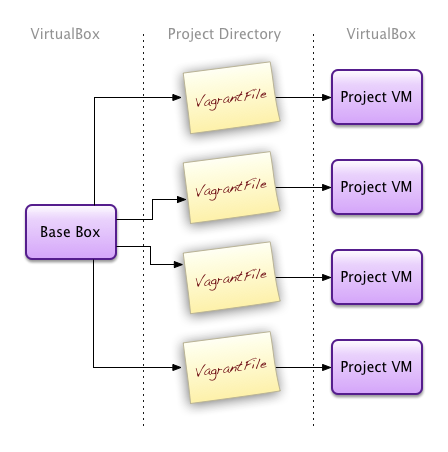 Vagrant automates creation and provisioning of virtual machines within VirtualBox via the command line, whilst also allowing for easy distribution and reuse across multiple projects. In this article, I’m going to look at how it can make life considerably easier when dealing with development environments. Previously I’ve written a couple of articles on virtualised development environments; one on VMWare and one on VirtualBox. Since then I’ve upgraded my model to use Vagrant, which allows me to control my environment per project, and also fixes me up with painless access to Puppet provisioning. This has completely altered my workflow for development. To help you to understand why, I’m going to walk through how Vagrant works and then look at setting up a Vagrant-powered development environment. VirtualBox Guest Additions for shared folders, port forwarding, etc. Thankfully the creation of base boxes has been done for you a thousand times over, and the subsequent base box files are available for download at various places across the interwebs. However, should you require something more specific, creating a base box is pretty undemanding and there are even programs like VeeWee which will automate this process for you. For more information on building your own base box, take a look at the Vagrant base box documentation. This is a really useful resource set-up by Gareth Rushgrove, the man behind DevOps weekly and also a passionate advocate of Vagrant. If you can’t find the box you need here, create it, host it somewhere, and let Gareth know so he can list it. Whilst you’ll probably use the same base box for multiple projects–my box of choice at the moment is a base install Ubuntu 11.10–you probably want a very different set-up per project. For instance, you might have a PHP project that requires a box running Apache and mod_php whilst a Python project better suits nginx proxying to gunicorn. This is entirely possible in Vagrant. This will create a nicely annotated VagrantFile. I recommend reading through it to understand the various settings available for you to configure. The VagrantFile will allow you to change settings on the VM that vagrant will generate for you; for instance, you might want your VM to only have 512Mb of RAM, whereas another might need 2Gb of RAM. You can also specify what base box to use, what ports are forwarded to the VM, what IP address it is configured with, how the VM should handle networking (bridged, NAT, Host Only etc. ), and many other system settings besides. Puppet automates the provisioning, patching, and configuration of operating system and application components across multiple servers. Vagrant uses Puppet to do exactly that; to set-up, patch, and configure the base box to suit your project. To do this, you need to specify that configuration in Puppet manifests–which are basically scripts or programs for Puppet (hence the .pp filename). The core of the Puppet language is the resource declaration, which represents the desired state of one resource. Manifests can also use conditional statements, group resources into collections, generate text with functions, reference code in other manifests, and do many other things, but it all ultimately comes down to making sure the right resources are being managed the right way. For more on Puppet and its manifests, I recommend reading the Learning Puppet documentation. You can probably even skip straight to the manifests section. Also, the resource types cheat sheet is invaluable. Another useful resource for Puppet is the Puppet Cookbook, which contains a collection of task oriented solutions in Puppet. Be aware, I tend to use Ubuntu server hence package management is handled via apt. This means these manifests will need a bit of editing should you want to use them on CentOS or some other linux distro. The Vagrant VM will be created according to your VagrantFile. This means there will be one per project. This granularity affords you a degree of independence with the VM, and allows you to treat it as a really powerful isolated root for your project. If you’ve ever used virtualenv when working with Python, imagine Vagrant to be virtualenv squared. Since you’re not sharing this environment with any other project, you can set it up, alter it, reconfigure it, and destroy it as much as you please; and since it’s entirely controlled by the VagrantFile and the provisioning scripts, those processes are easy and powerful. Once set-up, your vagrant VM contains a default user of vagrant. That user has full sudo access and is generally the user you’ll use for everything within your development environment. When you think about it, there’s no real need for complex user set-up within this VM since you could be setting it up and tearing it down as much as you’re doing development on it. If you do need complex user set-ups, there’s nothing stopping you doing that with Puppet or Chef during the provisioning stage. The first time you run this command, it will copy across the base box specified in your VagrantFile, boot it up with the specified networking set-up, and then provision it according to your Puppet manifests or Chef recipes. Once the box has been set up, and as long as it isn’t destroy, this command will boot up the box and confirm the provisioning. You can deactivate provisioning on this command using the --no-provision switch. Logs into your project VM as the vagrant user, using SSH keys. This circumvents the need for complicated SSH set-ups on your host machine and affords you all the power you need. This will remove all trace of your project VM from within VirtualBox. This means, the next time you run vagrant up, Vagrant will need to recopy across the base box and reprovision it. Most of the time you’ll only really want to do this if you’ve b0rked your VM somehow, or you’ve made a significant change to your VagrantFile; like specifying a different base box for example. Takes a snapshot of your VM and suspends it, allowing you to vagrant resume later. This saves you having to perform a length vagrant destroy && vagrant up cycle, but also stops the VM from taking up valuable memory and CPU cycles. Resumes a suspended VM from its snapshot state. The vagrant up command will also resume if it detects a suspended VM. Forces shutdown of a VM. This is basically a last resort shut down of your VM and the folks over at Vagrant recommend attempting a graceful shutdown via vagrant ssh first. Shows the current status of the VM related to the VagrantFile in the current directory. Runs the provisioning scripts without reloading the entire Vagrant environment. If you’re just tweaking or adding some cookbooks, this command can save you a lot of time. There are a few other Vagrant commands available to you but the above are pretty much the majority of what you’ll use on a daily basis. For the complete list, see the Vagrant commands documentation. Now that I’ve run through the workings hopefully you’ve got a better understanding of the power of Vagrant and how it can improve your development workflow. To further highlight that, let’s set-up a basic example Vagrant environment on a Mac, via the command line. With the release of v1.0 of Vagrant comes a new set of installation packages, available from the Vagrant downloads section. This is by far the best way to install Vagrant and will sort you out with all the prerequisites automatically. These are now the recommended and supported method of installation for Vagrant. When I began writing this article, these packages did not exist and, as such, I covered the slightly more complicated installation with all its prerequisites (for Mac). With these new packages, you should be able to follow along with the majority of this tutorial in Windows (albeit with slightly differing CLI commands). This is the recommended install for Homebrew. If you’re unsure, read the script first. It installs Homebrew to /usr/local so that you don’t need sudo when you brew install. It is a careful script, it can be run even if you have stuff installed to /usr/local already. It tells you exactly what it will do before it does it too. And you have to confirm everything it will do before it starts. Installing this gem will also install VirtualBox (if you haven’t already). Bob’s your uncle, Mary’s your aunt, and Dave’s your vicar’s love-slave. You are now ready to start building Vagrant environments, but first you’ll need at least one base box. You now have the option of downloading a base box, or you can build your own in VirtualBox using your operating system of choice. Since this is supposed to be a development environment, I’d recommend choosing an OS that is as close as possible to the one you’re going to use in production. For me that tends to be Debian or Ubuntu (which is really just another flavour of Debian), so I’m working with an Ubuntu base box. Creating a base box is straightforward as long as you’re confident building and provisioning servers. If you’re a bit unsure but you’re not scared to give it a go, I heartily recommend trying to build your own because it’s certainly a learning experience. To begin with, get yourself a disk image of your chosen OS. For me, that’s Ubuntu 11.10 Server AMD64. Once you’ve got your image, you’re ready to start setting up a VM in VirtualBox. Once that’s set-up, make sure you’ve “inserted” your OS disk image to the CD/DVD drive on the VM, and fire it up. I generally opt for a standard install for my base box, but if your OS of choice offers a low footprint install intended for virtualisation, you may want to opt to use that instead. If you do, make sure you know the differences; it may use a different kernel and therefore not support some of the motherboard and processor settings we discussed earlier. The --base parameter refers to the VM in VirtualBox and the --out parameter is what we want our newly packaged .box file to be called. Once you have a .box file, you’re ready to start using it with Vagrant–and you’re also ready to share it with other people should you so wish. For other options, as previously mentioned, have a look at Vagrantbox.es. The first parameter is the name Vagrant will use to refer to the box in Vagrantfiles, and the last is the path to your .box file. Now that you’ve downloaded or created a base box, and have made Vagrant aware of it, our next step is to configure a VagrantFile for whatever project we’re working on. It’s here, amongst other things, that we’ll specify which base box we want to use. If you’ve ever worked with Chef before, or indeed Ruby, you’ll recognise that the VagrantFile is Ruby. You’ll also notice that the folks at Vagrant have made newly created VagrantFiles wonderfully verbose, and if you read through the annotations, all the settings are explained. Since we’ve already installed this base box, we don’t need the VagrantFile to be aware of a hosting URL, so leave that line commented. The next line defines whether you want to run your VM headless (i.e. without firing up the VirtualBox GUI). Generally the only time you’ll want to uncomment this line is if you’re debugging a problem with the VM. Most of the time you won’t want to waste system resources on the VirtualBox GUI. With that in mind, leave it commented. This means the VM will be exposed to the host machine on the IP address 33.33.33.10, and will be able to access your network. However, machines other than your host machine will not be able to see the VM. Since we’ve uncommented this line, leave the bridged networking line commented. Now we have the opportunity to forward some ports from the host to the guest OS. This can be useful if you want to temporarily expose a host-only network VM to machines on your network, however, for the purposes of this tutorial, please leave this line commented too. Later on we’re going to install a web server and connect to this VM as if it were any other server on our network, so port forwarding is not required here. Next we need to define some folders to share with the VM, and how to share them. It’s a well recorded fact that when using VirtualBox on a unix-based system it struggles as the number of files within any shared folder increases. For this reason, if you’re running Vagrant on a Mac, it’s better to use NFS to mount your directories—Windows does not suffer the same issue so NFS is not required. This will create a directory /vagrant at the root of your VM. That folder will be shared with the directory on the host containing your Vagrantfile, implied by the . directory reference. For a Windows host, just set nfs: => false. This will look for our base manifest, “base.pp”, in a directory called “puppet” at the same directory level as our VagrantFile. We’ll set that up later. You’ll notice this particular command isn’t annotated in the VagrantFile. For more information about customising the specific characteristics of the VM, take a look at the Vagrant docs. Provisioning happens in Vagrant every time we run vagrant up or vagrant provision. This sets up the software on your VM according to a set of manifests (or “recipes” in Chef). Those manifests basically tell Puppet what it should script on the VM. This means you can update anything, including copying across files, updating files already on the system, installing and uninstalling packages, changing permissions, stopping and starting services, and a whole host of other software changes. Note that Puppet manifests have the .pp extension. You should be able to find syntax rules for all good editors to deal with this extension and file type. That was quite simple, right? Puppet already knows to use apt as the default package installer on Ubuntu, so this command checks the apt-cache to see if the latest version of the package is installed, and if it isn’t installs it. Equally simple. Here we’ve told Puppet to check the service nginx is running, and we’ve also informed it that the service has a restart function which Puppet can make use of. Notice the source exists within our /vagrant directory, which we’ve already set-up as a NFS shared directory. This means we’re effectively copying the file from there to the /etc/nginx/ directory on the guest. Also, if the destination directory does not already exist, Puppet will create it. Notice how I’m also setting the owner, group, and mode of the file during the copy. Note the reference to the resource we require is capitalised? This is a subtle difference between declaring and reference a resource. Notice I haven’t required the original file for this. That’s because it’s not a requirement for creating the symlink in the first place. The next time we fire up our Vagrant VM, nginx will be installed, set-up, and running, and attempting to serve a website from the /vagrant/static directory on your guest OS. This will be the static directory within the same directory as your Vagrantfile on the host. Ta da! You have successfully set-up a vagrant development environment with specific software requirements for a specific project. Congratulations! Now go away and hack it. So this has been an epic 5000 word look at why Vagrant is now my development environment tool of choice. I hope you can see that it makes working with multiple projects—each with their own requirements for an environment—as simple as possible. With a good understanding of the features of Vagrant, and also of the provisioning tool of your choice, you really do have the power to fire up and destroy environments on a whim. Apologies for the sheer size of this article but I wanted to make sure I covered as much as possible to help newbies get up and running quickly. It doesn’t take much effort, and it really empowers developers to be able to spin up new environments quickly for hacking around in.